A Doctor of Letters honoris causa was presented today to the Honourable Robert James Lee Hawke, Companion of the Order of Australia, and this country’s longest-serving Labor prime minister. The award was presented during a graduation ceremony for the Faculty of Arts, in which Hawke also presented the occasional address. His strengths in the industrial arena made Hawke extremely popular with the Australian people. Despite not yet being in Parliament, he topped an opinion poll of preferred Prime Ministers; his popularity far exceeding that of the currently elected political leaders. Hawke won federal election in 1983 with a landslide victory, despite a campaign of just four weeks, and backed that up with election wins in 1984, 1987 and 1990. Under his leadership, the government undertook systematic economic reforms, achieved by bringing together unions and employer organisations. Other achievements of the Hawke government included improved financial assistance to low-income families; the introduction of Medicare; the integration of employment, education and training; and achieving agreement with the States on a single-gauge national rail system. Greater environmental protections and improved human rights for Indigenous Australians were also achieved during this era. The key enduring legacy of Hawke’s term as Prime Minister of Australia was in micro-economic reform, however, which redefined the role of trade unions and opened up Australian finance and industry to global competition. 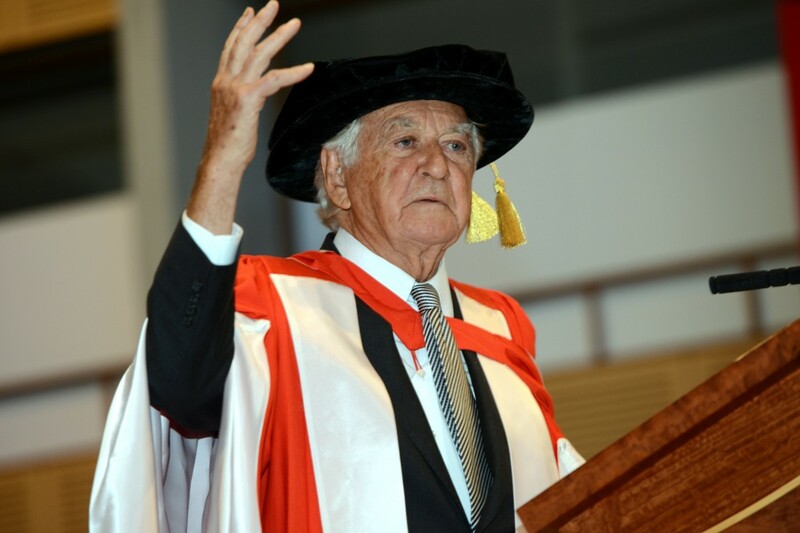 The Honourable Robert J Hawke gave the occasional address at a Faculty of Arts graduation ceremony today. (3.4MB) Photo: Effy Alexakis.